We are back with a new feature which will be very useful and a time saver for many of you. 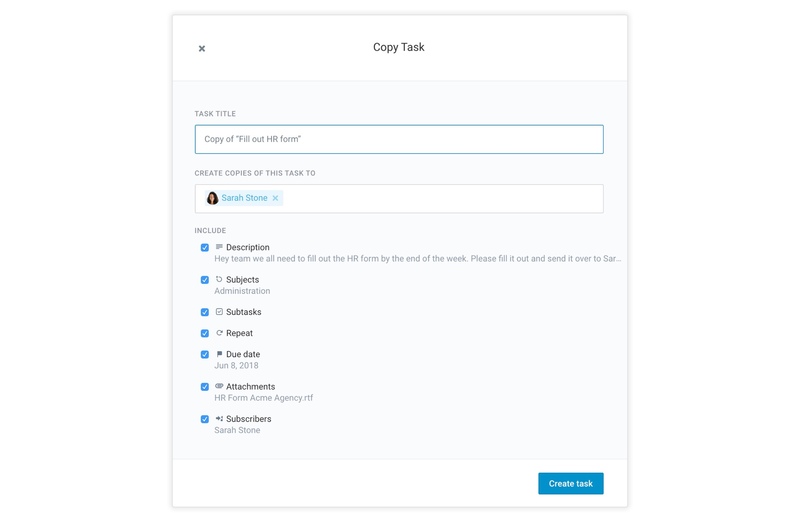 You will now be able to create multiple copies of a task. Up until now, copying a task in Azendoo meant copying the task only once. 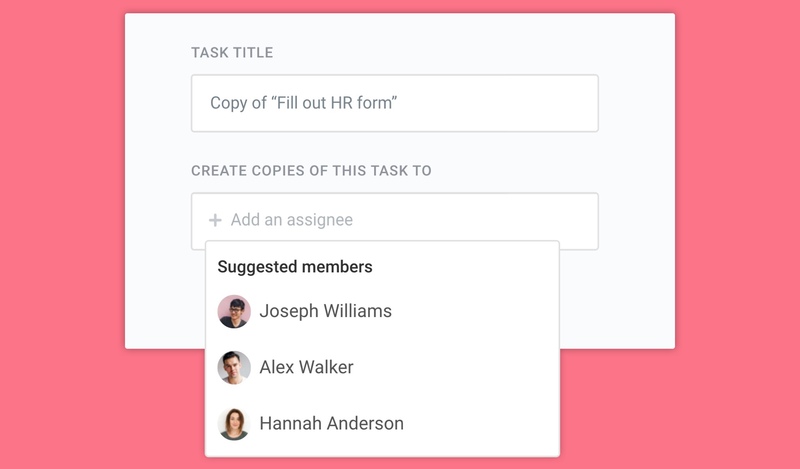 Now you will be able to copy the task once for every selected team member. Creating copies of a task can be quite useful in some use cases. As a prime example, this feature may come in handy when you need everyone in the team to do the same task, such as filling out a form for HR. It can also save you time and avoid you to create recurring tasks for multiple team members. Very handy for those having to share weekly/monthly (periodic) reports with the rest of the team. Create the task once, add the recurrence and create copies. 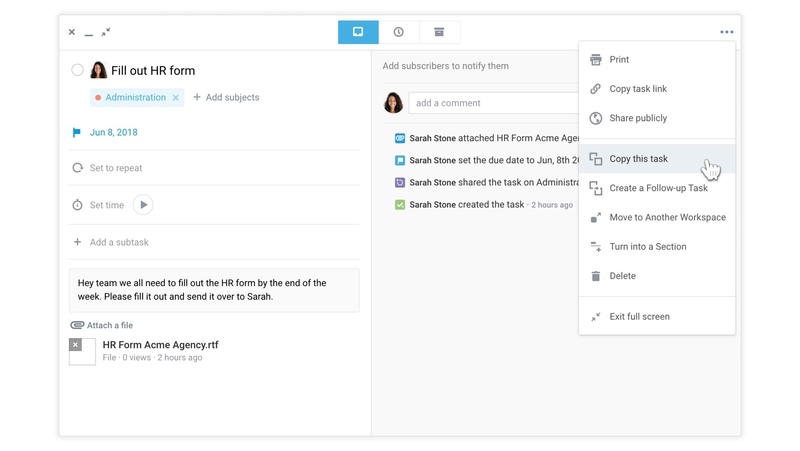 The real benefit of this feature is that you can tailor the task to be copied so that it makes sense for each new assignee. You can add subscribers to the task to track the progress. They will be notified each time a copy of the task is completed. There are multiple use cases in which this feature will save you time, more so if you have a large team. How do I create multiple copies of a task? To create multiple copies of a task, open the task you want to copy. Click on the three dots to display the task menu and select the Copy this task option. The following window will open. You can rename the copies of your new task(s) in Task title on the top of the window and select which members to create the task for in the field right below. Each assignee added will receive their own copy of the task and will be notified in Azendoo. If you remove all assignees, the task will be copied only once and will be unassigned. Once you've finished the set up, create the new task by clicking on Start copy. Depending on the number of assignees (and therefore the number of tasks to create), the window might not close immediately and you will notice a spinning animation. However, you can close the window and the copy will continue in the background. You can verify the creation of said tasks by going to your Team tasks todo list and check if the new tasks are displayed. That's it. 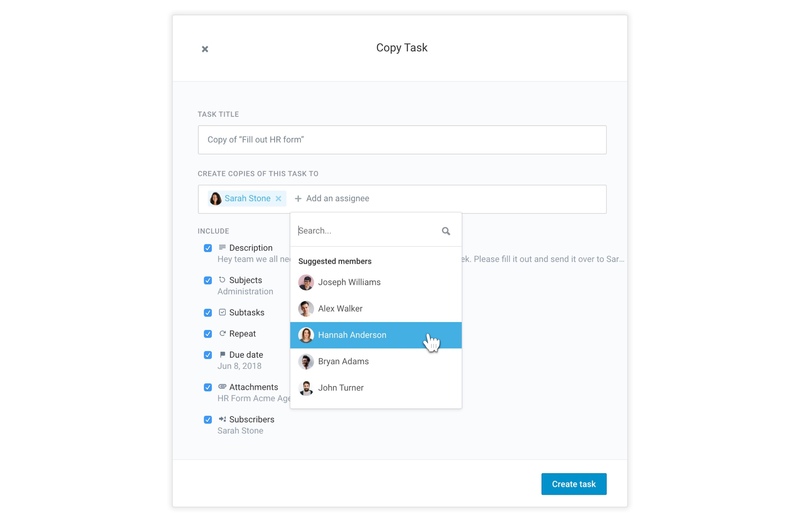 You can now create multiple copies of a task and assign them to your team members in just a few clicks.